Two new intensive-care ambulances have been given to Murzuk municipality, in the far south of Libya, by UNDP. They will be used by Murzuk general hospital which has not had an ambulance since late 2011, when the last one stopped working. Demand for ambulance use in the area is reported to have almost doubled as a result of increased numbers of migrants passing through the area and who need to be taken to hospital because of accidents or illness. The hospital currently provides health services to 65,000 people. 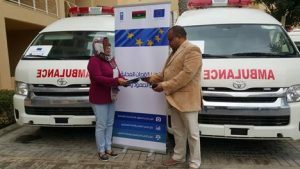 The ambulances, which were handed over in Tripoli, have been funded by the EU’s Strengthening Local Capacities for Resilience and Recovery project. The three-year project aims to increase the capacities of municipalities in Tripoli, Benghazi, Sebha, Sabratha, Murzuk and Kufra to serve their communities. Two ambulances, also funded by the project, are also to be handed over to Kufra which is likewise facing difficulties getting people to hospital.